By swapping out one specific hydrogen atom for an isotope twice as heavy, researchers have increased the shelf life and detection ability of fluorescent probes that are essential to studying a variety of inflammatory diseases, including cancer and atherosclerosis. The probes detect and measure reactive oxygen species, which play an important role in disease processes. 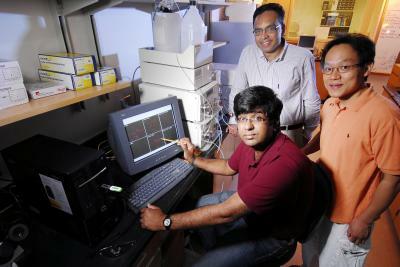 "By replacing a hydrogen atom with a deuterium atom during the synthesis of several fluorescent probes, we increased the stability and shelf life of the dyes, and also improved their ability to detect smaller concentrations of reactive oxygen species," said Niren Murthy, associate professor in the Wallace H. Coulter Department of Biomedical Engineering at Georgia Tech and Emory University. Deuterium is an isotope of hydrogen that has a single proton and single neutron in its nucleus. Its atomic weight is therefore twice that of the much more common hydrogen atom, which lacks a neutron. 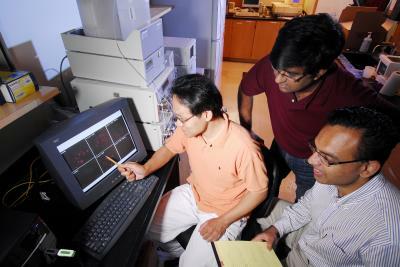 When Murthy and Coulter Department postdoctoral fellow Kousik Kundu designed and synthesized various fluorescent probes with deuterium instead of hydrogen, the dyes were not as susceptible to spontaneous degradation by air and light as their hydrogen counterparts, which made them significantly more accurate at detecting reactive oxygen species in cells and animals. The researchers studied probes that included dihydroethidium (DHE) -- the current "gold standard" for imaging reactive oxygen species -- and hydrocyanines. Details of the research were published in the early view of the journal Angewandte Chemie International on July 20. 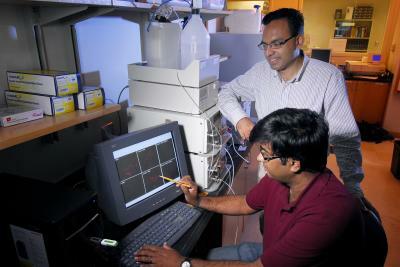 The work was sponsored by the National Institutes of Health and the National Science Foundation. The study showed that while the standard fluorescent probe DHE was 60 percent oxidized by air and light after 10 days in storage, its deuterium counterpart was only 20 percent oxidized during that same time. These findings could have significant implications for companies that produce fluorescent probes and other compounds, according to Murthy, because commercializing and shipping the modified probes will be easier. Another advantage for scientists using deuterium-containing fluorescent probes is that after reacting with reactive oxygen species, the probes produce the same fluorescent dye that their hydrogen counterparts produce. "This is important from a practical standpoint because scientists have developed protocols with DHE and other fluorescent probes that they will be able to continue using by simply substituting the more stable and accurate deuterated version into the assay," explained Murthy. Fluorescent probes detect reactive oxygen species by undergoing a chemical process called amine oxidation. The mechanism of amine oxidation for reactions involving reactive oxygen species differs significantly from reactions involving air and light. In addition, reactions with deuterium-containing probes occur at a much slower rate because deuterium is a heavier atom. Murthy and Kundu decided to use these mechanistic and kinetic differences to selectively slow the oxidation of the fluorescent probes by air and light while maintaining their reactivity with cellular reactive oxygen species. To test the selective suppression of oxidation, the researchers examined the kinetic isotope effect -- a value that measures the ratio of the rate of a chemical reaction with hydrogen compared to the same reaction with deuterium to air and radical oxidation. They investigated the ability of the deuterium-containing probes to compete with a common enzyme for superoxide -- a reactive oxygen species that is a form of molecular oxygen with one extra electron. The researchers found that the probes' oxidation mechanism with superoxide was different than for spontaneous oxidation because the two reactions exhibited different values for the kinetic isotope effect. Kinetic isotope effect values for spontaneous oxidation ranged from 3.7-4.7, whereas values for superoxide oxidation were between 2.5-2.8 for many different types of deuterium-containing fluorescent dyes, including DHE. "This was the key experiment that demonstrated that there was a much larger difference in the way the hydrogen and deuterium compounds reacted to spontaneous oxidation than how they dealt with oxidation by a reactive oxygen species," explained Murthy. Murthy's collaborators W. Robert Taylor and Sarah Knight tested the ability of both types of dyes to detect reactive oxygen species inside cells. Since the deuterium-containing probes were less affected by air and light and background fluorescence was suppressed, the researchers found that the dyes more accurately detected small amounts of reactive oxygen species. Knight is an Emory University postdoctoral fellow and Taylor is a professor in the Coulter Department, the director of Emory's Division of Cardiology, and a member of the Atlanta VA Medical Center's Division of Cardiology. Following the cellular experiments, Knight and Coulter Department postdoctoral fellow Seungjun Lee investigated whether the kinetic isotope effect would similarly improve the ability of H-Cy7 -- a hydrocyanine dye developed by Murthy -- to detect radical oxidants in vivo. In experiments, the deuterium-containing version of Cy7 generated a 10-fold difference in fluorescence intensity versus control probes compared to only a five-fold difference for the hydrogen probe. "This new process of replacing hydrogen with deuterium is potentially valuable because the positive results are universal among many different types and classes of probes," explained Murthy. "All of the modified probes generated less background fluorescence, while maintaining high reactivity with reactive oxygen species and generating similar levels of fluorescence in cells and animals stimulated to produce them." Murthy indicated that although the kinetic isotope effect had been used to improve drug stability, it has never been used to improve probe development. "Based on our results, we anticipate numerous applications of deuterated radical oxidant probes in biology and an increased application of the kinetic isotope effect in biological probe development," added Murthy.